By: Shawn C Baker on 10/02/2014. Before setting off on the Bullets tour it occurred to me that it would be very cool to first re-read Lapham’s often overlooked pulp noir thriller Murder Me Dead. I had purchased and read MMD monthly at the time of its publication (via Lapham’s independent El Capitan, circa 2000), but I had never returned to it. This morning while nursing a bit of a hangover I brewed a few pots of good, black coffee and plowed through Murder Me Dead in a very long time. And just as I expected, I had quite a remarkable time doing so. When MMD originally came out I was largely unfamiliar with Noir films. I understood what Noir was in some basic sense due to a dalliance with Carol Reed’s inimitable The Third Man, but my experience was far more centered around the camera work of that film, the conventions of the genre itself completely lost on me. I didn’t realize there were more films out there (granted The Third Man plays to few conventions, but for our purposes here we’ll save that discussion for another day). To this day I still would not claim to be even moderately knowledgable about “Noir” compared to some friends I have who are very into it. But of course, as these things work, knowing a few folks that are heavily into the genre has informed me on it as well. Within the last two and a half years I’ve watched a number of really good Noir films, beginning with a re-watching of the aforementioned The Third Man, on into Kiss Me Deadly, The Big Combo, Double Indemnity and He Walked By Night, just to name a few of the heavy hitters right off the top of my head. I bring all this up because without really having any kind of a background in Noir films on that first, monthly read of MMD I missed an entire layer of the story. MMD is an exercise in the classic style of the Noir – Murder, Betrayal, Ill-Fated Love, Betrayal, Passion, Betrayal. You get the picture. Through the course of the story Lapham plays with his own personal brand of the Noir aesthetic and I have to say, it feels great. The story and his wonderfully realistic yet also very personalized artwork, which perfectly compliments the tone of older Los Angeles, crime and death. And it feels fresh, like new life breathed into the genre. This is, I believe, partially because Mr. Lapham’s characters always feel so damn real and partially from the comic medium itself. Murder Me Dead begins with a fishy suicide; a wealthy and temperamental woman named Eve hangs from the fan in her living room and her failed-musician husband Stephen suddenly finds himself on the receiving end of his dead wife’s fortune, much to the chagrin of her equally wealthy family. Under suspicion of foul play Stephen finds himself alone with his guilt when a figure from his past shows up and leads him into a romance fifteen years in the making. From here things get bad – bad in fairly classic Noir fashion. There’s a murder, a blackmail, a jail sentence. People end up not being who you think they are and all of it leads to what has got to be one of the most unsettling endings to a story ever. And that was another part of the thrill of this story, by this author. It was genuinely cool that Murder Me Dead ended. 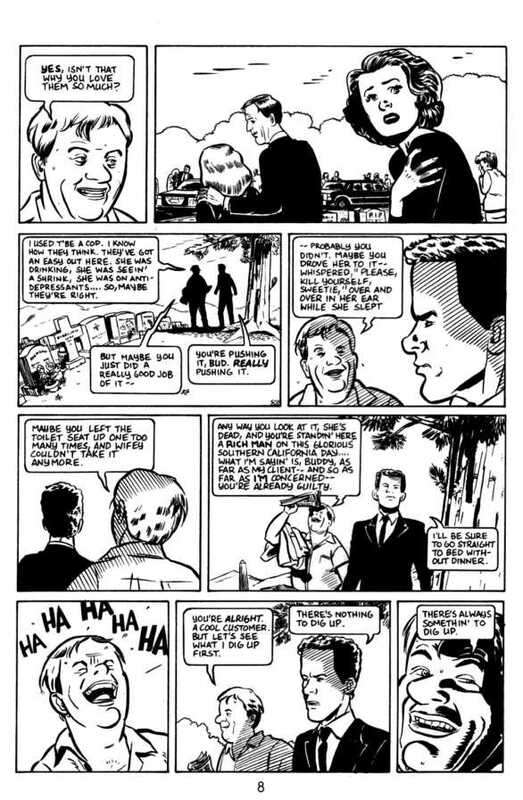 In his afterword Mr. Lapham’s proudly confesses that after Stray Bullets‘ ongoing nature it was a wonderful feeling for him to tell a story with a definitive end. In this way MMD acquires another fascinating angle, as I believe then it can also be seen as a writer’s tool – a cathartic jog through David Lapham’s imagination; a holiday if you will from his – at the time – “main gig”. In the *gulp* fourteen or so years since MMD and the nine years since that fateful cliffhanger that Stray Bullets left off on Mr. Lapham has produced some pretty awesome work (I especially LOVED the creator-owned Young Liars at Vertigo and the Terror, Inc. stuff for Marvel). It’s cool to see him work strictly as a writer, playing with other people’s toys. However, after reading Murder Me Dead again I am even more excited for Stray Bullets. If that goes well – which I can only cross my fingers it will with all of the – deserved – hype it’s getting, maybe one day in the not so distant future David Lapham will give us another self-contained story like MMD. That would be wonderful.